RSMSSB Live Stock Assistant Recruitment 2019: The Rajasthan Subordinate and Ministerial Service Selection Board (RSMSSB) is inviting candidates for the various Live Stock Assistant (LSA) or Pashudhan Sahayak and Tax Assistant (TA) Posts. Applicants who are interested in RSMSSB Pashudhan Sahayak Vacancy 2019 can fill the Online Application Form on or before the last date. For the online application form, candidates need to visit the official website of RSMSSB. 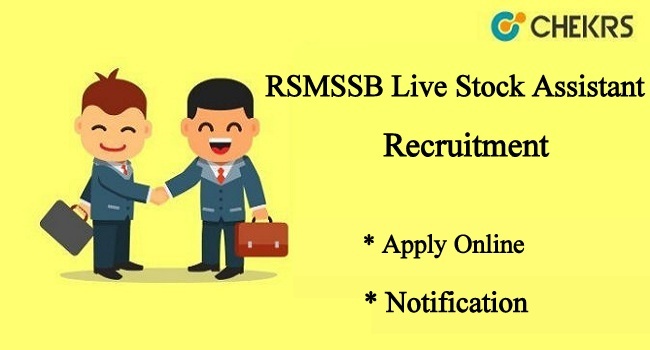 You can check the RSMSSB Live Stock Assistant Recruitment 2019 Notification to get full details about the junior engineer Vacancies. Therefore read the whole article and can check Eligibility, Education, Age Limit, Selection, Application Process, and more information. Latest Update: RSMSSB is going to publish the Live Stock Assistant Recruitment 2019 Notification for various vacancies. Interested candidates can fill the application form before the last date. The Rajasthan Subordinate and Ministerial Service Selection Board have been released Live Stock & Tax Assistant Recruitment 2019 Notification on the official website to fill up the various vacant posts. All eligible candidates who want to apply online for Rajasthan Pashudhan Sahayak Recruitment 2019 can follow these tables and get the complete details for the online application form. Candidates remember that RSMSSB Tax Assistant Bharti Online Application Form 2019 will have to fill on or before last date. After the last date of application form will not be accepted. Application fee can be deposited the last date from a valid channel. The Candidates are informed that candidates who are interested in Live Stock Assistant (Pashudhan Sahayak) Vacancy they can complete the application process from before the last date and the RSMSSB Tax Assistant Recruitment 2019 Application Form will be started soon. After complete the application process, candidates need to deposit the Application Fee which are given in the below table. Candidates who are interested with essential qualification can apply online for RSMSSB LSA TA Recruitment 2019 on or before last date. For this process, candidates firstly check their eligibility criteria which are given in the below section. Working Knowledge of Hindi Writing in Devnagri Scripts and any one of the Rajasthan Dialects. Candidate’s age must be between 18 years to 40 years as on 1st January 2019. And age relaxation for reserved category candidates will be based on as per Rajasthan Government Rules. For Live Stock Assistant Posts: The Pay Scale will be Rs. 26300- 85500/-. For Tax Assistant Posts: The Pay Scale will be Rs. 26300-85500/-. Firstly the candidate visits the official website of RSMSSB. Then go on “Recruitment Advertisement” block. Download notification and read the whole notification carefully before going to apply. Then click on the link which says “Apply Online”. Fill all require details like Personal details and academic details which should be correct and true. Check all details and press on submit button. Pay your application fee through online banking. Take a print out of your application form on A4 size page and keep it for future use. To receive more updates on RSMSSB Live Stock Assistant Recruitment 2019 keep visiting our site www.jobs.chekrs.com. In case of any query or review, place your valuable comment in the commenting section below and our team will revert you in a short while.